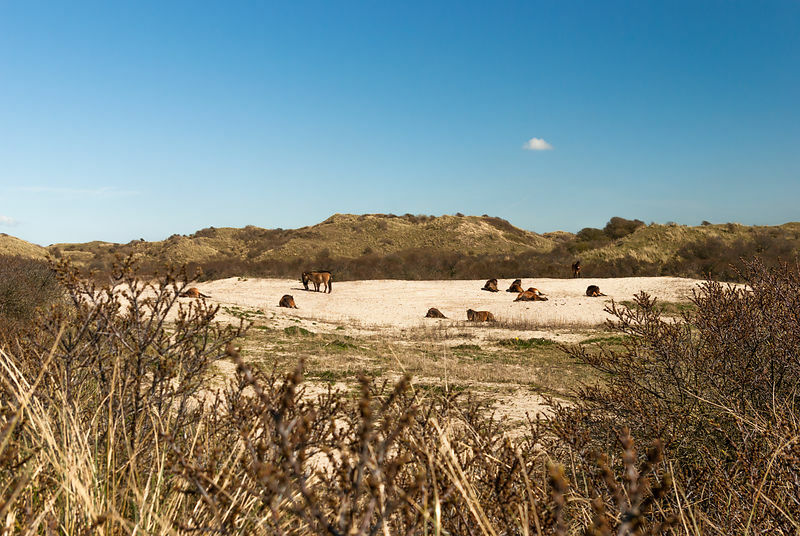 During a walk in the dunes, we encountered a herd of semi-wild Konik horses. 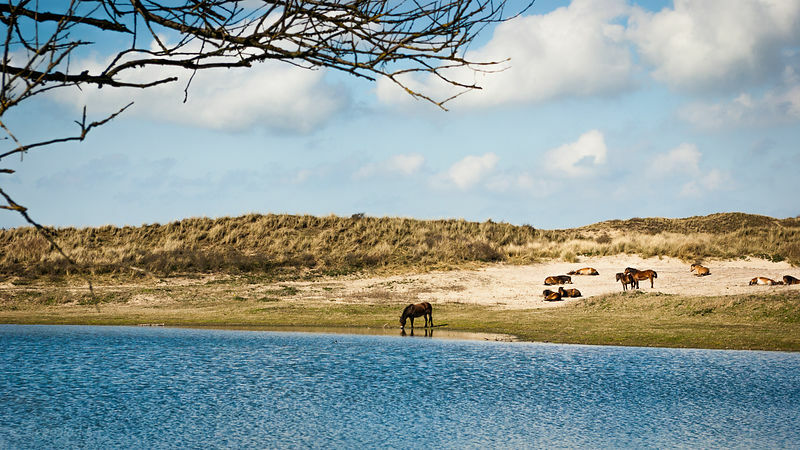 De horses were resting in a dune valley, and drinking the water of one of the many little lakes in the dunes. A dune lake arrises when there is a surplus of rainwater, that can not sink in the ground because of an impermeable ground layer. Or when the dune valley is lower than the groundwater level. Dune lakes contain fresh water. Large herbivores like Koniks are brought back into the Dutch and European nature reserves and live in the wild, to help maintain the natural eco-systems. Large Route hiking paths are long distance hiking paths (LAW's) throughout Europe, marked with red-and-white (often painted) markings. The Holland Coast LAW 3-2/3 path also passes through the dunes at Egmond aan Zee. 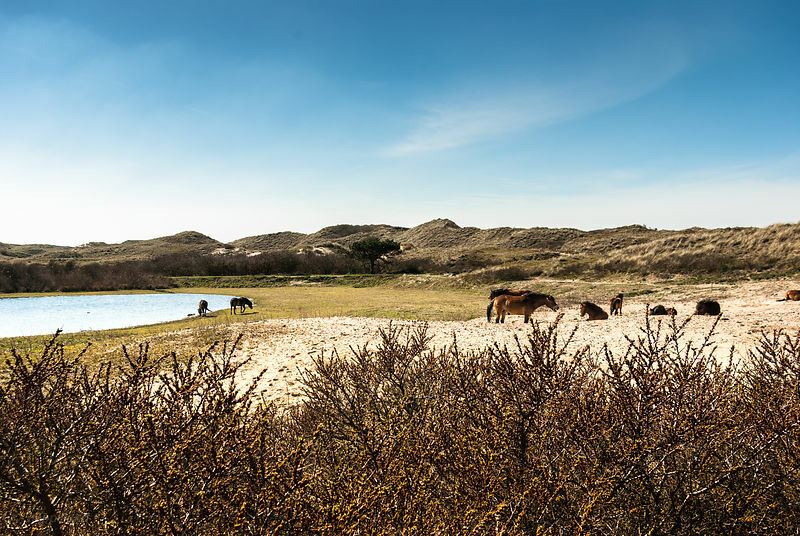 Konik horses in the dunes - panorama. 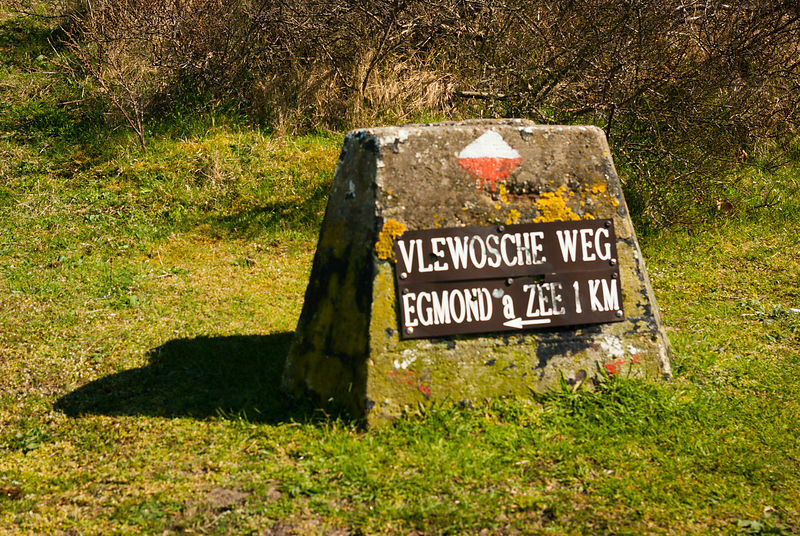 Large Route hiking paths are long distance hiking paths throughout Europe, marked with red-and-white (often painted) markings. The Holland Coast LAW 3-2/3 path passes through the Dunes at Egmond aan Zee, the Netherlands. 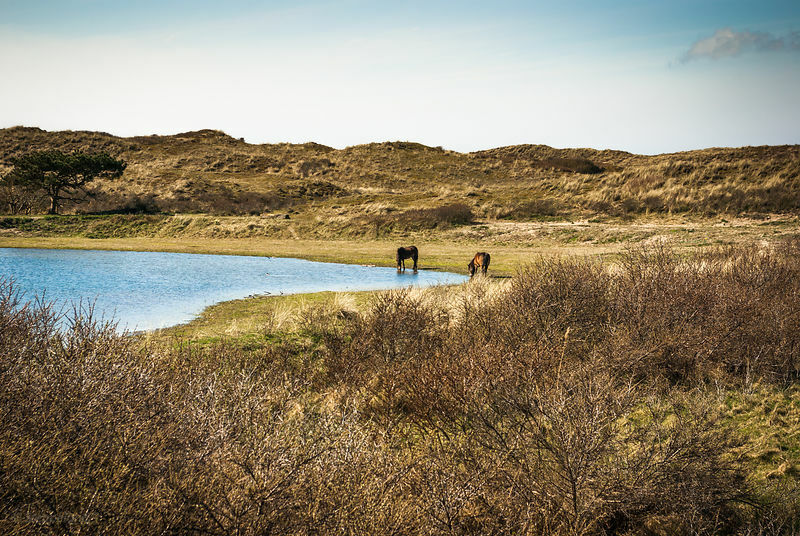 Two wild Konik horses near the water. 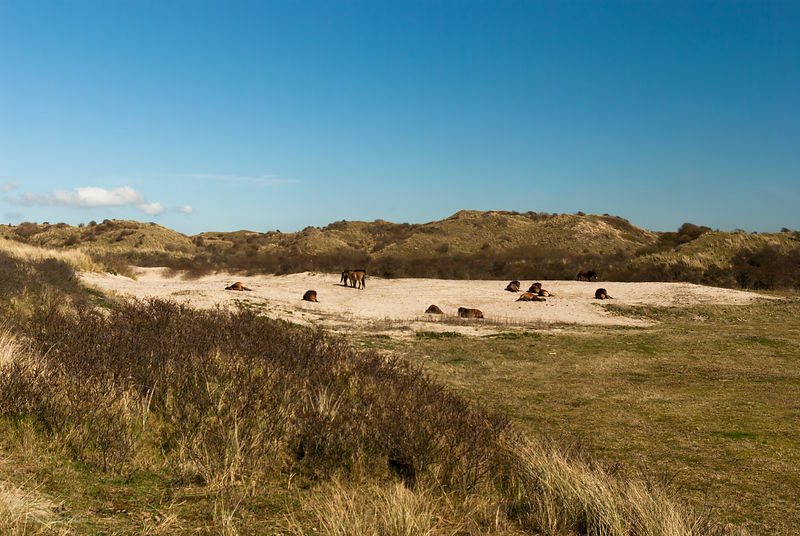 Two wild Konik horses in the dunes at the edge of a seep. 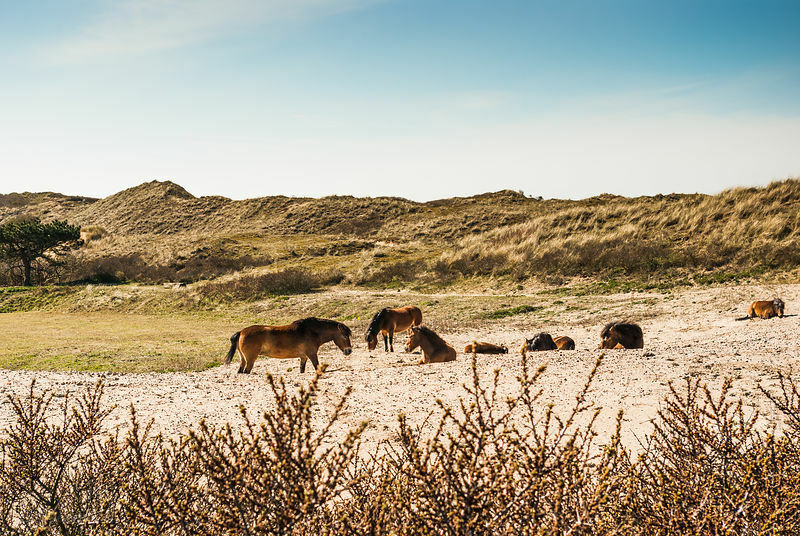 Two wild Konik horses in the dunes at the edge of a seep. 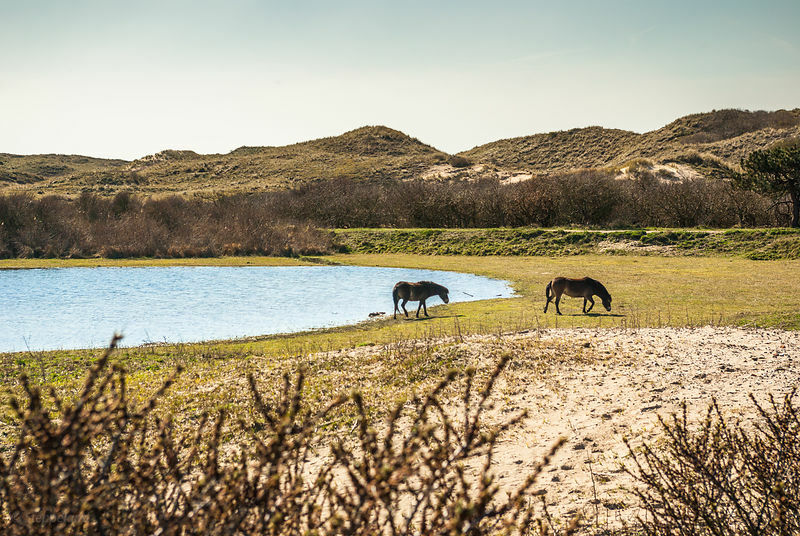 Two horses drinking the water of seep, a little dune lake in a moist dune valley. A seep is a moist or wet place where water, usually groundwater, reaches the earth's surface from an underground aquifer. Large herbivores are brought back into the Dutch nature reserves and live in the wild, to help maintain the natural eco-systems. Photo made in the Noord Holland Dunes Reserve at Egmond aan Zee, the Netherlands.